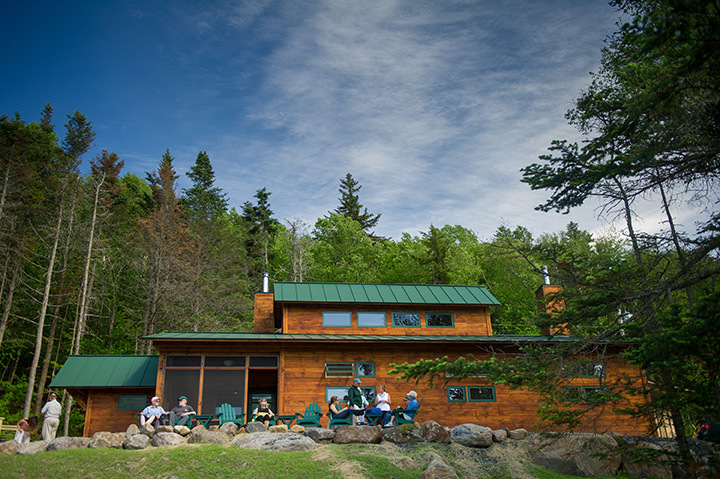 The new Class of 1965 Bunkhouse was dedicated on June 11, 2015. The night before his 50th Dartmouth Reunion, Roger Hansen ’65, president of the Class of 1965, was sweeping floors and cleaning the windows of a bunkhouse at the foot of Mt. Moosilauke, at the edge of New Hampshire’s White Mountains. Hansen, and many others, wanted to be sure the brand new cabin, which can accommodate 26 people, sparkled for its dedication on June 11, 2015. View photos. “It’s been a real hands-on effort and a marvelous display of goodwill from so many people,” says Hansen, of Keene, NH, who also worked on the joinery of the post and beam building. The project was a coming together of alumni, students, other volunteers who spent a collective 3,950 working hours on the structure. David Hooke ’84 of Vershire, VT, led two free timber-framing workshops as part of the “barn raising” aspect of the construction. Classmate Dave Beattie ’65, of Eliot, ME, a former commander of a U.S. Navy submarine, worked for about five weeks at the construction site. He spent his nights in a sleeping bag in a nearby cabin. “Dave gets up when the sun goes up, he works on the cabin, and then he has breakfast,” said Stuart Keiller ’65, the bunkhouse project manager. Though the cabin has been under construction since September 2014, the interior smells as if the wood was cut just yesterday. The white pine is from College-owned property in Corinth, VT, and the patio is made from granite from Dartmouth’s old Bradley Gerry building. A striking piece of bronze artwork by Dimitri Gerakaris ’69 greets visitors from the main entrance, and there’s a beautiful view of Mount Moosilauke from many vantage points. 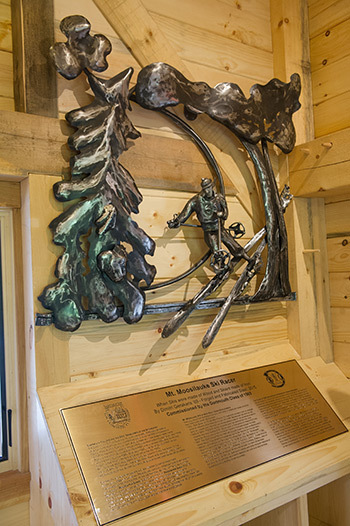 Dimitri Gerakaris ’69 created this bronze sculpture specifically for the cabin. The origins of the project go back to July of 2013, when ‘65s gathered for a mini-reunion at Dartmouth to celebrate their 70th birthdays. It was then that they decided to embark on the ambitious project. Within the next year, 11 lead donors committed, and along with 127 other alumni they raised $450,000 and an additional $100,000 for an endowment to maintain the bunkhouse. The new building stands only about 100 feet from the Moosilauke Ravine Lodge, built in 1938. 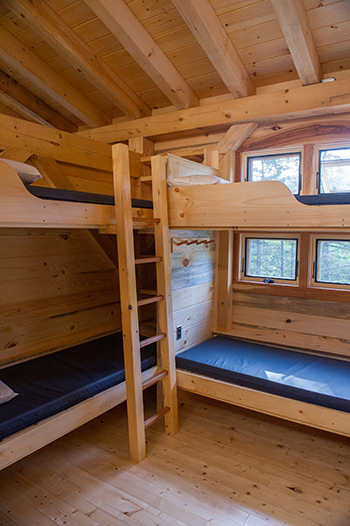 Additional, newer cabins have sprung up in those 77 years of the lodge’s existence, and now there are five bunkhouses for guests, and a crew cabin for student employees. Many alumni fondly recall their time at Moosilauke during Dartmouth Outing Club orientation “Trips” for incoming students. At the dedication ceremony, held on the lawn in front of the Bunkhouse, Keiller, of Stevensville, MD, recalled his own freshman year, 54 years ago, and he thanked alumni from around the world for being there that day. It was here that Keiller and David Mulliken ’65 of Honolulu, Hawaii reunited for the first time in 50 years.